The photos below show the Maxime Bar as developed by Mr. Roosevelt Harvey and demonstrated by him. We are sorry that the photos are a little dim but they were the only ones available so we use them rather than wait for clearer ones at a much later date. This is one of the most valuable pieces of supplementary equipment we have seen and should be made available in every private and public gym. On the left we see the bar being used for half or quarter squats. It is quite safe as you will never have to worry about getting from too low in the squat and not being able to get up. You just lower the weight to the floor and step from under it. In the center we see the Maxime bar being used for strengthening the body to support heavy weights in the jerk. On the right it is used for a high dead lift. Notice how the bar can be adjusted to any height. We predict that you will see a lot of these bars in gyms throughout the country and higher records will result from it. Note the parallel between this bar and William Boone's method of developing great strength. The science of bodybuilding has come a long way; however, it still has a long way to go. Gradually, more information is being accumulated, but the method of accumulation is slow and inefficient. If a man discovers something new, it is hard to get anyone to believe in his new discovery. For he himself to leanr something usually requires personal experimentation. There is a definite need for research laboratories, in which scientific experiments could be made on all phases of body-building, and then the results published for all to see. This would be vastly superior to the present haphazard method of information dispersal. Physicians have developed their science to the point where they work with basic laws that govern all cases. Chemistry still has not progressed that far, and the chemists, for the most part, must work with the facts concerning each individual case, since they do not have basic laws formulated that explain all situations. At least, however, all existing knowledge of chemistry is substantiated by experiments, and can be taken as wholly true. Can the bodybuilder look in a book and find the basic laws of bodybuilding? Can he even find a list of facts, proved experimentally, that all his colleagues agree on? No! He only finds more views and theories about body-building than there are vitamin pills in the country. Each originator of an idea thinks that he has proved it, but he has not. To call something a scientific fact, it must be carefully tested and the results, and all pertinent information recorded. These ideas must be subjected to experiments of others, the results of which substantiate them, before it can be said, "This is a scientific fact." 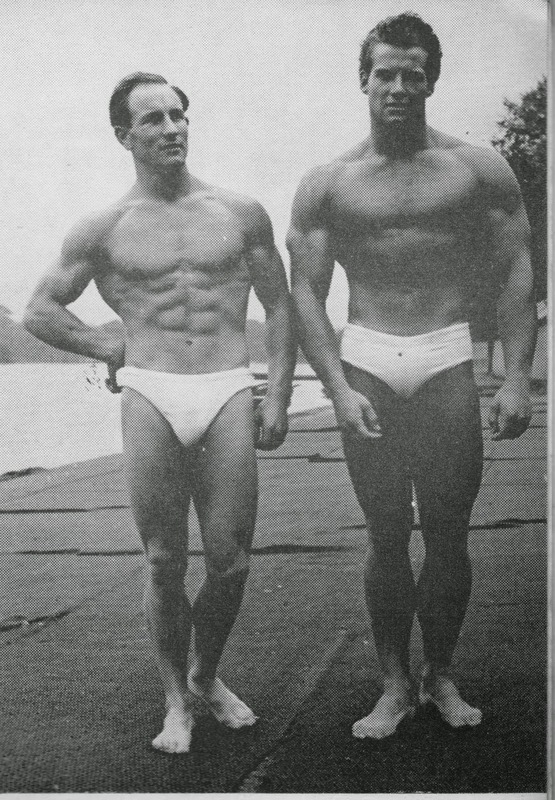 It is to this end that the knowledge of bodybuilding be disseminated, that this article is written. Now to describe the Maxime Bar. Picture for yourself, a goal post as used in football games. At the base of the upright posts are attachments for adding weights. The cross bar is so arranged that it can be adjusted at various heights, moved up or down. This is analogous to the Maxime Bar. The whole bar lifts up; it is not attached to the floor. The cross bar is adjusted and locked at the desired height; it does not slide on the upright bars during exercise. Next, the exercise. Let us take the quarter squats. After you lower the cross bar until it is about six inches below your shoulders, you lock it in place. Getting under the bar, you proceed to stand up, lifting the whole rig up from the floor. This process is repeated the desired number of times. The purpose of the Maxime Bar is to enable one to perform semi-contraction movements with high poundages. Semi-contraction work when used on small muscle groups will develop tendons; this principle was brought out some time ago in an article by Earle Liederman. An example of semi-contraction for small muscle groups would be as follows: a semi-curl in which the weight is raised only several inches.This will develop the tendons of the flexor muscles of the arm. However, when this principle is applied to heavy exercises, such as would be the case with semi-squats, the muscles are developed. The reason for this fact if that tremendous weight can be used, imposing terrific strain on the muscles, both for movement and bracing. Proof of this may be found in leg development of those who have used it. A new method of progression is used. Instead of adding a few pounds when able, you start with a movement of only a few inches, gradually increasing the distance of movement by lowering the bar. You continue this until, in the case of the squat, the sticking point is reached. I do not mean going stale, but rather that point where the muscles have the least leverage. For the squat, this will be approximately a half-squat. Then you raise the bar to its former place and add 50 lbs or so. This method insures rapid progress. A safety feature of the Maxime Bar is that it cannot trap you in any way. With the regular bell, a sudden weakening while squatting is a dangerous thing. I once saw two men working out with half-squats. The squat was performed until the person sat on a bench (the weight was still on the shoulders). A rest of a second was taken, then the man would come up. Finally, when the weight had been raised to 500 lbs., one of the men collapsed back, almost taking his friends leg off in the process. If the bar had come down on him instead of rolling down his back, or had it hit his friend's leg solidly, the results would have been very serious indeed. Another favorable factor is that since you do not use full contraction, you do not burn up as much energy. Some fellows who can't seem to gain on regular programs, gains while training on the Maxime Bar. We believe this to be proof of less energy being used in order to gain. "How I Trained to Jerk 400 Pounds"
gives some of the same exercises that have been given for years by the inventor of the Maxime Bar, Roosevelt Harvey, director of the weight lifting team of the Boston Social Union. Holding the weight on the chest in position ready for the Jerk, one can do semi-squats of 2" to 8". Using a heavy weight in this exercise helps the lifter in many ways. First, it makes the lifter lift the weight with perfect body support. The little dip before the weight is tossed overhead gives most of the force in the Jerk. With an extremely heavy weight, this motion can be performed only correctly; otherwise you can't get the bar off the ground. Continual use of this exercise will develop tremendous power in this push. Using a weight half again the weight of one's limit jerk (150%), will accustom the body to very heavy weight at the chest. I have seen 550-600 lbs used in repetitions. When a record attempt is cleaned, the weight seems light on the chest, and is automatically in the correct position. Another exercise to perfect the other end of the Jerk is to place the cross bar a few inches lower than you can reach when standing erect, then get under it in Jerk position, feet split, arms locked overhead, hands on bar. From this position straighten up the front leg, then edge up to full standing position. This exercise when performed in repetitions with weights greater than your record jerk will build terrific locking out power under a heavy weight overhead. Other exercises performed on this bar are half dead lifts, half supine presses, and the Hise Heavy Shoulder Shrug, or Symbolic Squat. [ --- Some years ago, Joseph Curtis Hise introduced what he called the "Cartilage Mass Theory." A lifter grew muscle size, or mass, by the stimulation of the cell manufacturing areas - the Reticulo-Endothelim system. "Growth," said Hise, "depends on mass of connective tissue," and went on to point out that to maintain a favorable balance of cell manufacturing areas, exercises for growth should be FEW and EASY, and for strength should be FEW and HEAVY. He tried to strike a balance between growth and strength by exercising the pectoral muscles, because these "require the use of little nerve energy." In effect, what Hise said was this . . . "The better your posture, the more efficiently will your body function . . . the more quickly will you become bigger and stronger." One of the exercises suggested by Joe Hise was his "Symbolic Squat." You simply held an extremely heavy weight across the shoulders, shrugged them as high as you could at the same time taking several deep breaths, making an effort to inhale and exhale! The body was held erect, the knees locked, the floor was "gripped" with the toes . . . that is, the toes pressed down on the floor. Hise suggested that the exerciser should breath through the mouth, lift the chest HIGH with each breath, contract the trapezius and the muscle in front of the neck, making a DELIBERATE effort to raise the chest and shoulders as high as possible. His theories, later examined by Dr. J. S. Van Wye, an osteopathic surgeon, were approved: Dr. Wye adding that in this "Symbolic Squat" the bar should be raised up and down two to three inches with each breath with light weights and as much a possible as the exercised grew accustomed to handling extremely heavy poundages. Now, for the results observed from the use of the Maxime Bar. Calves become larger and stronger, the thighs become larger and more powerful, the shoulders and chest become stronger, larger and more accustomed to supporting very heavy weights, the back and neck muscles increase in both size and strength. Mr. Harvey deserves thanks for enlightening one more fact about body-building, one more piece fitted into the jigsaw puzzle that will be an efficient science. To Mr. Harvey, J.C. Hise, Roger Eells and others who have dared to think and experiment belong the thanks of all body builders.